A hydrocarbon is an organic compound consisting entirely of hydrogen and carbon. 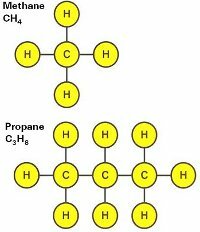 A molecule of propane and methane is pictured on the left. 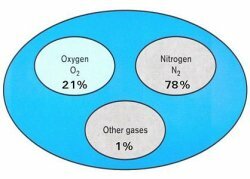 However, since the oxygen in real-world combustion comes from the air around us, undesirable byproducts in the form of nitrogen will be produced. To mimimize the amount of 'undesirable' emissions, a perfect air to fuel ratio has to be achieved. When theoretical perfect air/fuel mixtures are applied, stoichiometric combustion is achieved. 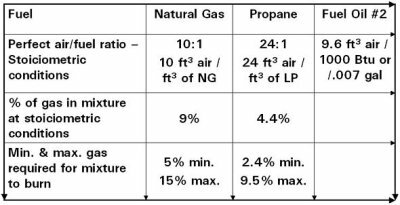 In the real world, it is very difficult to maintain the perfect 10:1 air/gas ratio due to a number of factors. 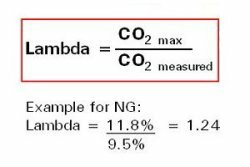 The common way of expressing the usage of more than the stoichiometric combustion air is percent excess combustion air. Incomplete combustion causes single carbon atoms to combine with single oxygen atoms, productin carbon monoxide. 12,800 ppm - Death within 1 to 3 minutes. 1,600 ppm - Nausea within 20 minutes. Death within one hour. 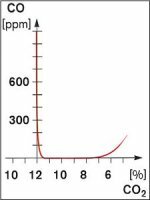 800 ppm - Nausea and convulsions. Death within two hours. 400 ppm - Frontal headaches 1-2 hours. Life threatening after 3 hours. 50 ppm - Maximum concentrations for continuous exposure in any eight-hour period. 9 ppm - Maximum indoor air quality level. 0 ppm - Desirable level.